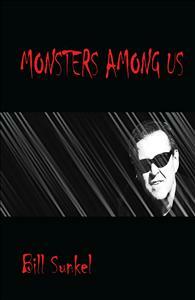 Monsters Among Us is a new book and album by New York City singer-songwriter-author Bill Sunkel. The CD album (included) features thirteen new original songs, while the book contains full lyrics, detailed musician credits, deep (and frequently revealing and provocative) backstory about the meaning behind and creation of each song via the author’s fascinating and informative Decoder© notes, and original full-color photographic illustrations of each track, as well as performance photos and other snapshots from Bill’s personal collection. In a world of digital downloads and virtual everything, think of it as the ultimate album cover. As a long-time fan of Bill Sunkel and his work, I must say that his latest release, Monsters Among Us, feels like the crowning achievement of a prolific and formidable career as a songwriter, poet, singer, and artist. As impressive and compelling as Bill's prior work has been, in this latest release, Bill seems to bare his soul as never before, each song layers deep with emotion, intelligence, gravitas, and humanity. The songs alone would well be enough to convincingly and effectively convey all of this, but combined with the stunning artwork and insightful and revealing commentary of the book, the result is as powerful an artistic statement as I can recall experiencing in many years. So, if you're wondering where, in this throw-away, disposable, redundant (yet utterly forgettable) music environment, all the true artists have gone, you need look no further than Monsters Among Us -- it is a true artistic achievement that will no doubt stand the test of time. So many great songs! This is the type of album where a different song is your favorite each play. Great, clear recordings, too. Bill has a fantastic, unique voice. The book is a wonderfully executed companion piece that really makes for a complete experience. An emotional ride that's highly recommended. Bravo!